JERUSALEM – Israeli warplanes struck Hamas positions in Gaza after Palestinian militants there fired dozens of rockets and mortars at southern communities early Wednesday, the military said. The Palestinian fire came hours after the Israeli military said it struck Hamas infrastructure in response to “arson balloons” launched from Gaza into Israel. Israel has been battling large fires caused by kites and balloons rigged with incendiary devices or burning rags, launched by Palestinians in Gaza that have destroyed forests, burned crops and killed wildlife and livestock. Fawzi Barhoum, a spokesman for Hamas, praised the rocket attacks calling them “a legitimate right that bombing is met with bombing,” but did not take responsibility for them. The Israeli military said Palestinians fired about 45 rockets and mortars at Israel. Seven projectiles were intercepted by the Iron Dome defense system and at least three fell prematurely, landing inside Gaza, it said. Fighter jets targeted about 25 Hamas targets overnight in response to the heavy Palestinian fire, it said. The exchange early Wednesday was the biggest flare-up between the sides in weeks. However, no casualties were reported in Israel or Gaza. Some Palestinian rockets exploded inside Israel damaging property and peppering homes and cars with shrapnel. 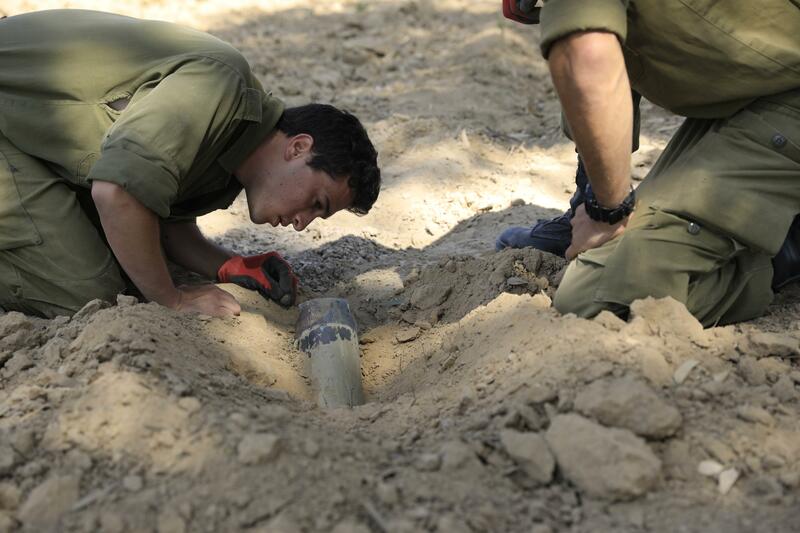 One mortar exploded next to an Israeli kindergarten. “The Hamas terror organization targeted Israeli civilians throughout the night with a severe rocket attack and is dragging the Gaza Strip and its civilians down a continually deteriorating path,” the military said. Military spokesman Lt. Col. Jonathan Conricus said many Israelis spent the night in bomb shelters in communities near Gaza. Conricus wouldn’t elaborate on open-fire regulations regarding the kite and balloon threats but said those who launch such devices “are engaged in hostile activity.” He said so far the army has fired near those launching the devices and at infrastructure but added Israel has warned it “will not tolerate” the current situation of daily airborne attacks on its territory. Tensions are high along the Gaza border after months of weekly mass rallies led by the Islamic militant group that rules the territory turned violent. Over 100 Palestinians have been killed by Israeli fire since they began. Israel says it is defending a sovereign border and nearby communities and accuses Hamas of using the protests as cover for attempts to breach the border fence and carry out attacks. The protests are aimed in part at drawing attention to the decade-long Israeli-Egyptian blockade on the territory imposed after Hamas, a group sworn to Israel’s destruction, seized control of Gaza. Barhoum, the Hamas spokesman, said demonstrations will continue and implied that more incendiary devices will be launched at Israel. The military said an aircraft fired warning shots near a group of Palestinians launching fire bomb balloons at southern Israel on Wednesday afternoon. Balloons attached to an explosive fuse, that were launched from Gaza, later wafted onto a trampoline used by Kibbutz children and was dealt with by sappers, Israeli police said. Police said there was no bomb attached. Prime Minister Benjamin Netanyahu warned at a ceremony for military officers that Israel’s response to attacks from Gaza “will intensify as necessary,” but Cabinet Minister Naftali Bennett of the Jewish Home party called for a tougher stance. “Just imagine living in fear that while you sleep at night a fire kite might hit your home,” he said at the Israel Democracy Institute. “I will not back down until we implement a new policy in which we shoot directly at terrorists and not just next to them,” he added. Published: June 20, 2018, 10:33 a.m.